Hahaha!!! Trying to plan for alone time is inviting the wolves to come inside. I actually smile like a hyena when the clock strikes naptime. 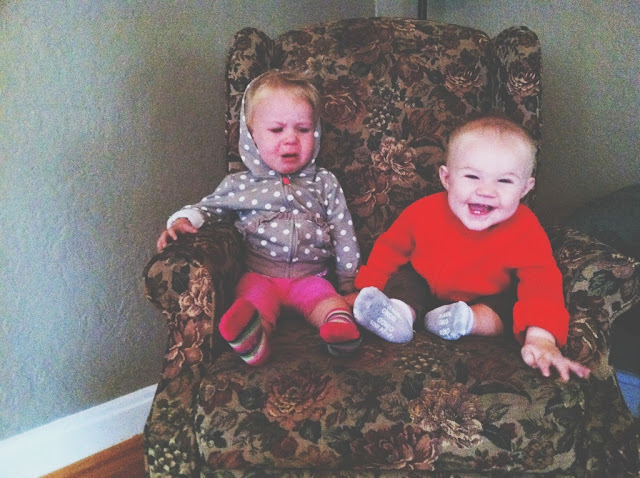 HAHAHAHAHA oh J's face is PRICELESS. and I love her hoodie. Oh my goodness, I love him! And Julia would fit right in over here. Are there any pictures of her NOT crying...?! And I can't believe you're still running when you are preggo. I never could do it - made me feel all blechy. Aren't you glad that it's your boy that's the linebacker and not the opposite? Don't hate me readers, I like skinny boys but you know, any reason for Julia to not have a body complex is golden because I'm pretty sure her blog personality won't win her any crowns. I feel qualified to comment on your daughter's personality bc mine, well, she's J's soul mate... heaven help us. You seriously get the motivation award for being howmanyweeksnow preggo with number three and STILL RUNNING! You amaze me! Also, Julia's hoodie is so flippin' cute!! Who says girls are easier? Oh right....no one. That's why God made them so cute! 3 cheers to Simon for letting his pregnant homebound wife get some fresh air. Mena has the same socks as Julia. And she is wearing them right now. That's all. Just curious....are you at the point yet when you run that your bladder is ready to betray you? I could only ever run while preg until about 5 mos or so and then it became urine precarious....although my bump WAS significantly larger than yours, perhaps 'tis why. Enjoy your solo runs while you can, they truly are so much more enjoyable than pushing the jogger and soothing fussy offspring!